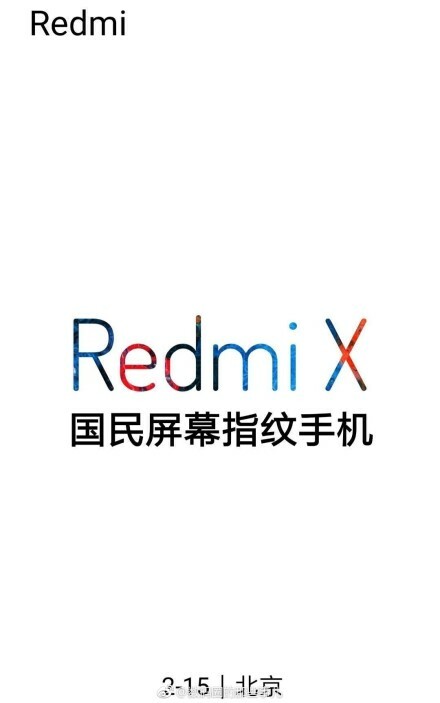 Redmi X Launch Poster Leaked with February 15 Date - Playfuldroid! A leaked poster of the Redmi X smartphone is now doing rounds on Weibo. The poster reveals that the smartphone will be announced on Feb. 15. The translated text on the teaser image reads “national screen fingerprint scanner mobile phone” which indicates that the Redmi X will be a budget-friendly smartphone with in-display fingerprint scanner. The Redmi Note 5 Pro is slated for a release after China’s Spring Festival in the second week of February. Probably, the Redmi Note 5 Pro may end up launching with Redmi X on the same date. Nothing else is not known on the specifications of the smartphone. However, there is a possibility that it could be a better specced phone than the Note 7 and Note 7 Pro. Hence, it could be equipped with a waterdrop notch screen and Snapdragon 710. The above poster has not been released by Redmi. Hence, it is advisable to digest with a grain of salt and wait for further leaks and official confirmation to know whether the Redmi X phone really exists or not. Redmi is reportedly planning to introduce 4 GB RAM + 128 GB storage edition of the Redmi Note 7 in China with a price tag of 1,399 Yuan. The handset features a 6.3-inch IPS LCD display, Snapdragon 660 chipset, 13-megapixel front camera, 48-megapixel + 5-megapixel rear camera and 4,000mAh battery with fast charging support.